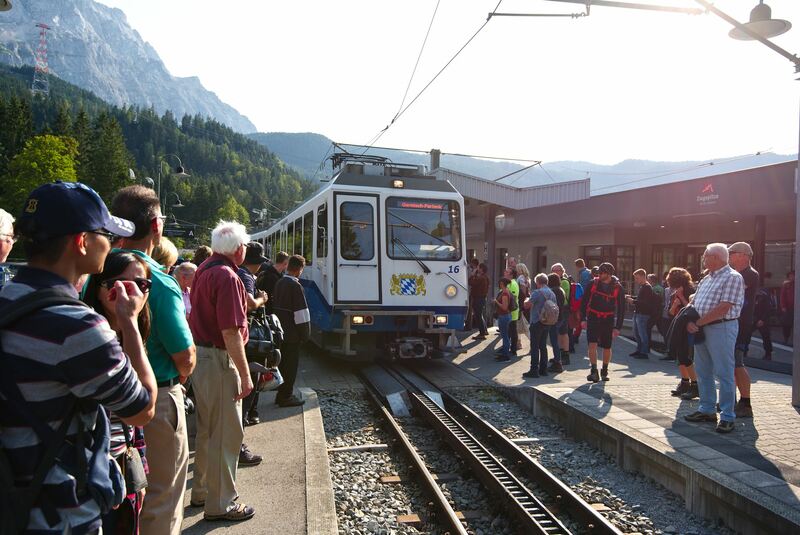 We had rented an apartment in Garmisch-Partenkirchen and could therefore comfortably walk to the next stop of the rack railway. 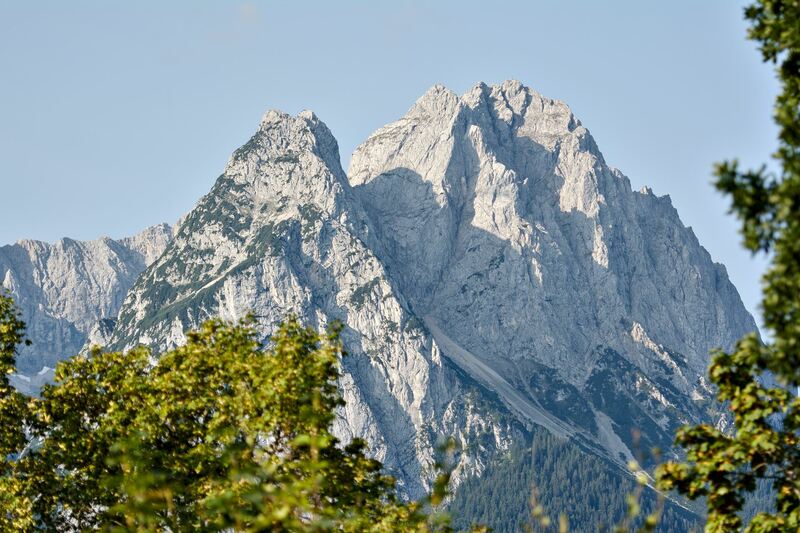 On the way we had a good view of the Waxenstein peak at the beginning of the mountain range. 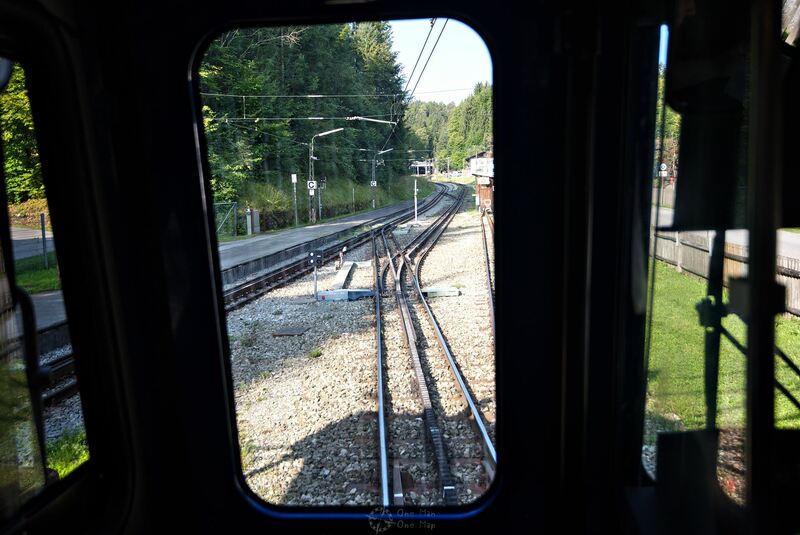 The rack railway already has to climb quite some gradients on the few kilometres to the Eibsee. 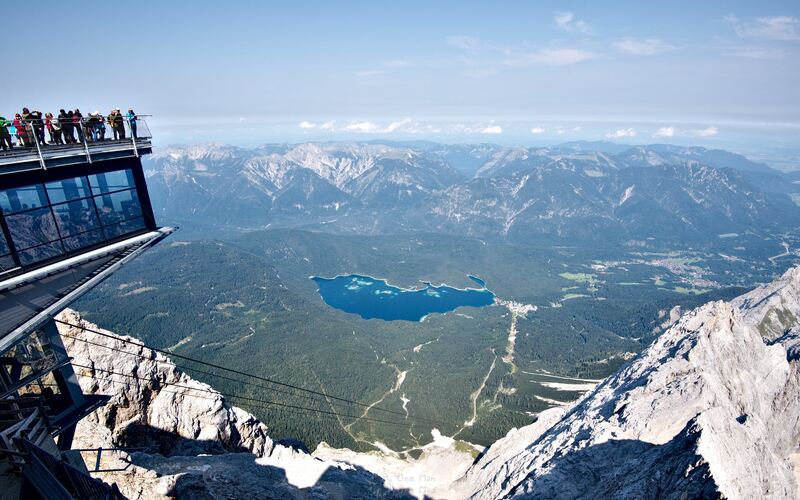 No wonder: even if it may not look like it on the maps, the lake lies 265 meters above Garmisch-Partenkirchen. 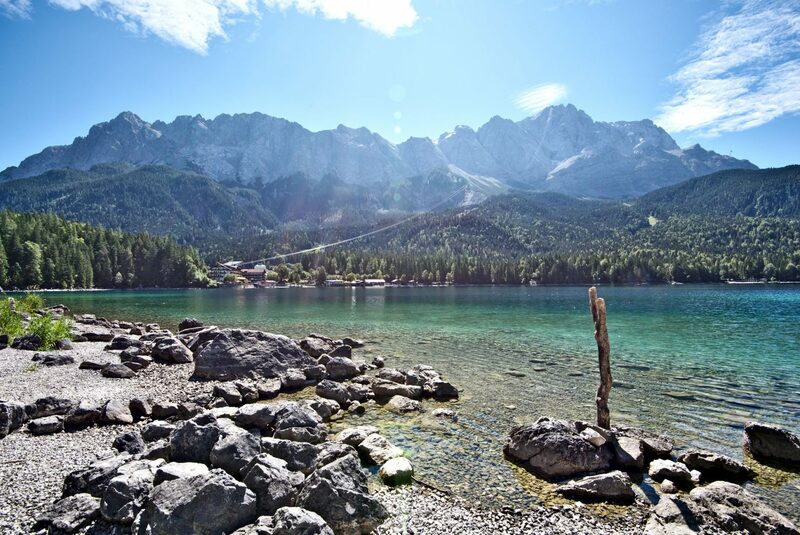 Finally arrived at the Eibsee, hikers luckily have it much easier than the rack railway. 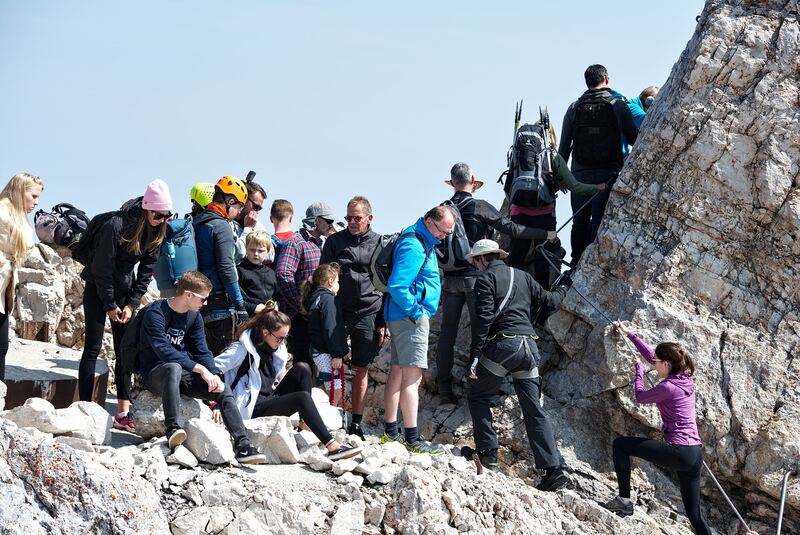 The seven and a half kilometre long circular path has only a single ascent on the southern side, otherwise it always runs at about the same elevation close to the shore. 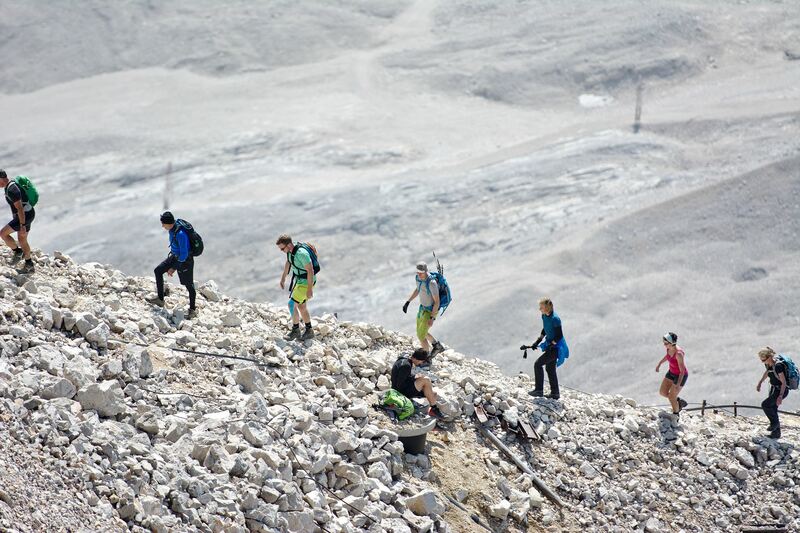 The landscape shows itself from different sides depending on the time of day. 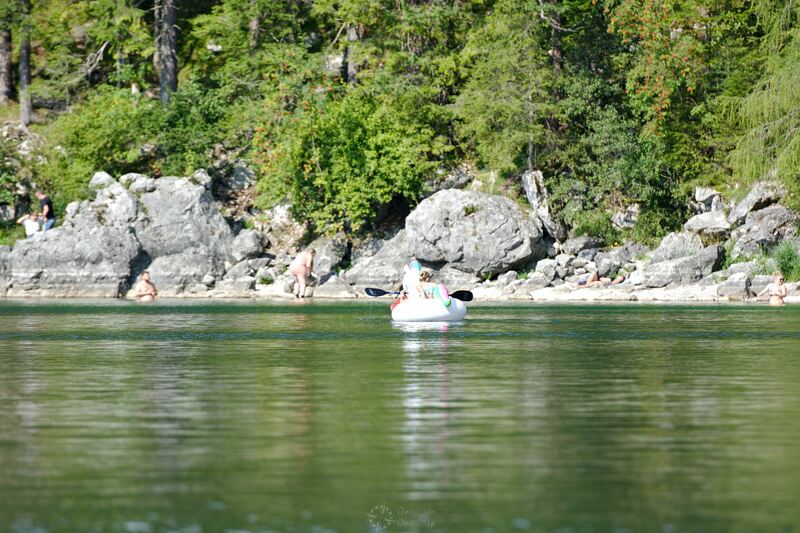 Early in the morning, when the sun has not yet made its way through the clouds, the bathers are sitting at the breakfast table and the pedal boat rental store has not opened yet, one feels completely alone. 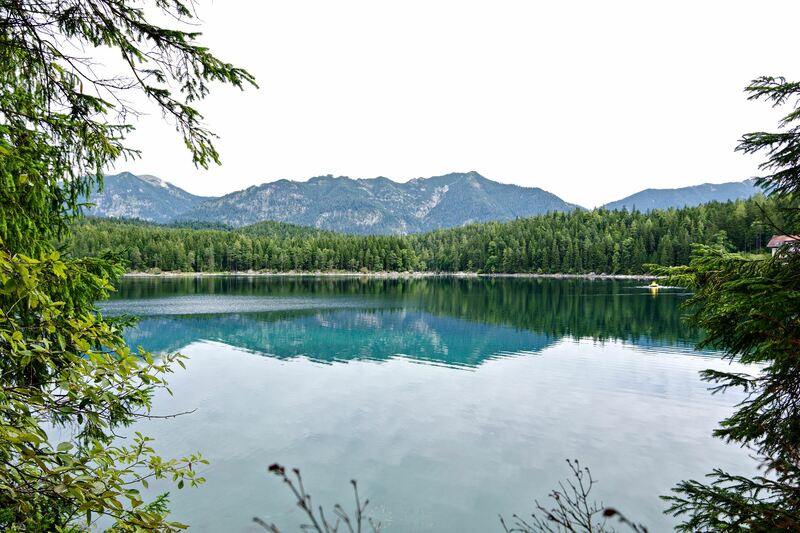 The silence, the clear, calm water, the shades of blue and green – all this also reminded me of pictures from Canada, Sweden or other areas further north. 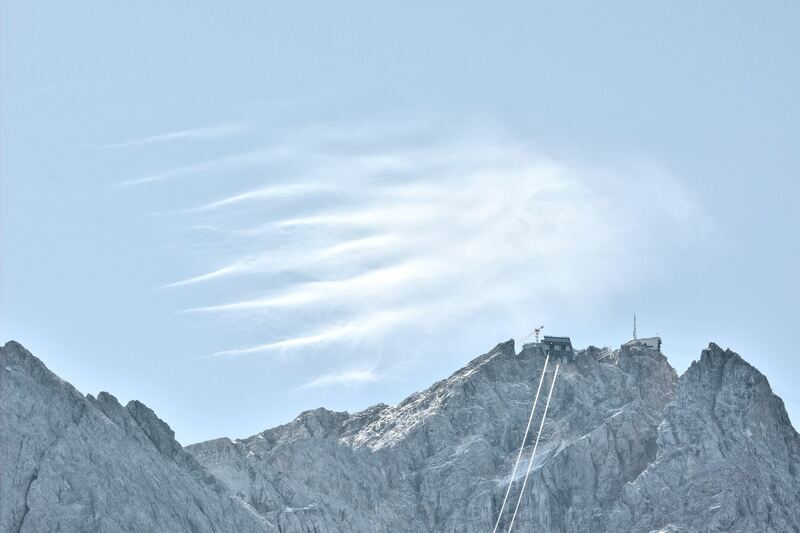 As the sun rises, the clouds disappear and slowly reveal the view of the Zugspitze massif. 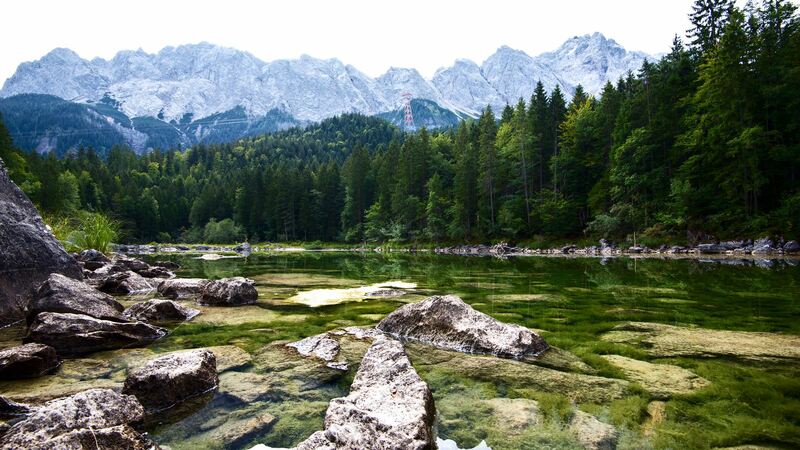 The clear water turns into a radiant blue surface, and trees and bushes shine in lush green. 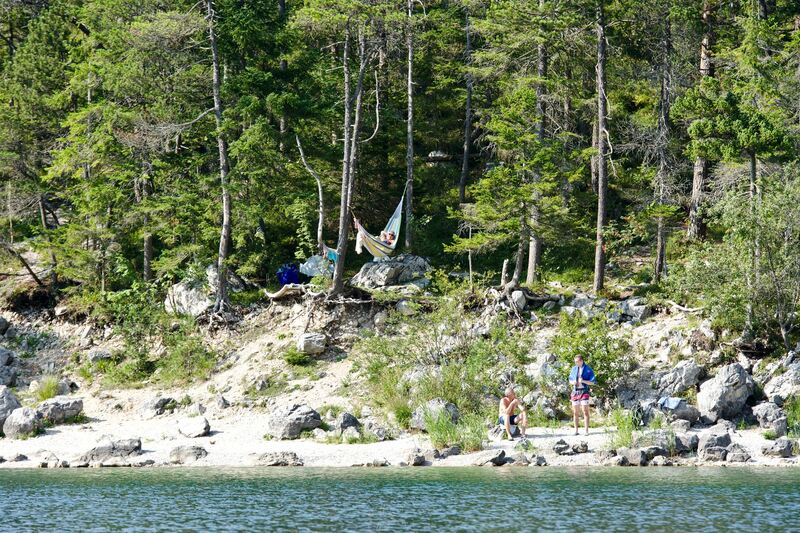 With the rising temperature the bathers start to find their way to the beach. 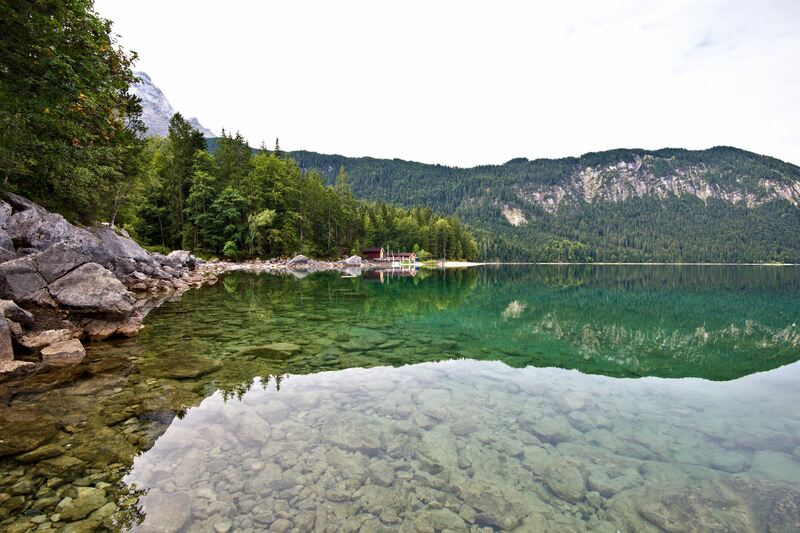 The Eibsee has been privately owned by the Terne-Rieppel family, who also runs the only hotel in the area, for almost 150 years. 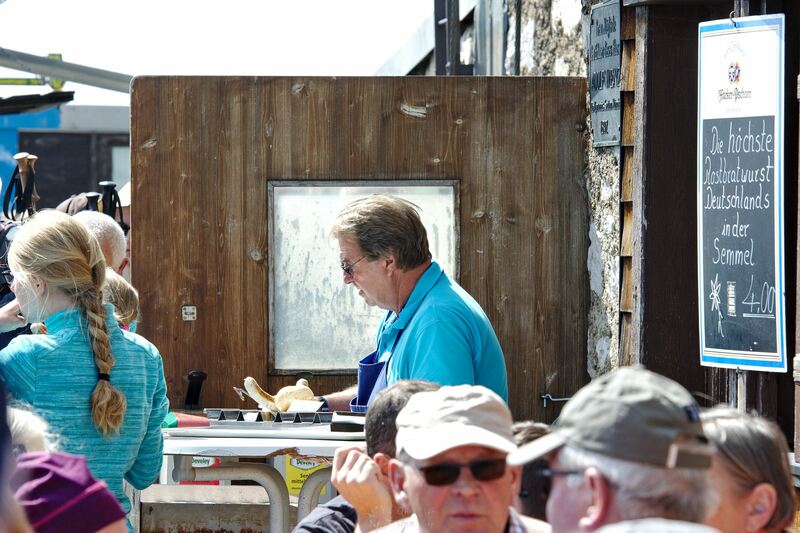 Some activities such as fishing and diving are therefore reserved to the hotel guests. Pedal boats and stand-up paddling boards can be rented at a store close to the restaurant. 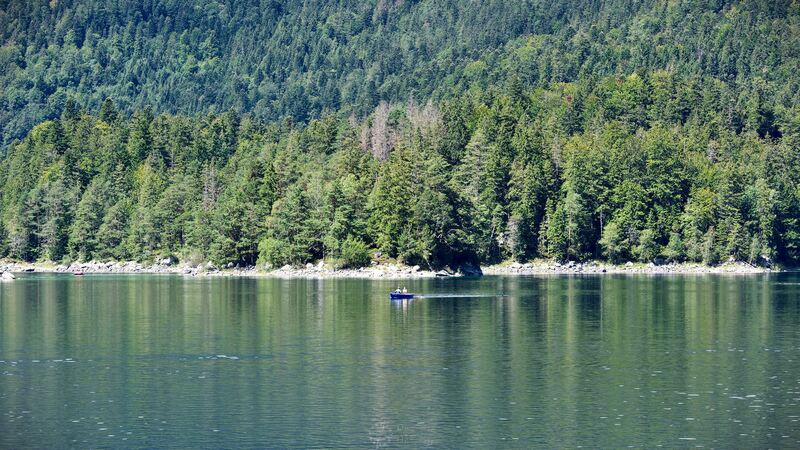 If you prefer to let others do the work, you can set sail on the “Reserl”, the only motor ship on the Eibsee. 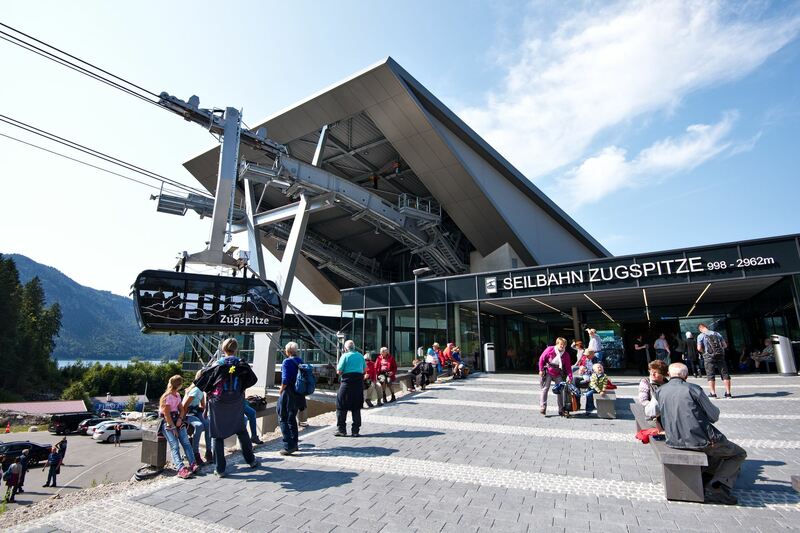 The valley station of the Zugspitz ropeway is located directly next to the Eibsee station of the Bayerische Zugspitzbahn. 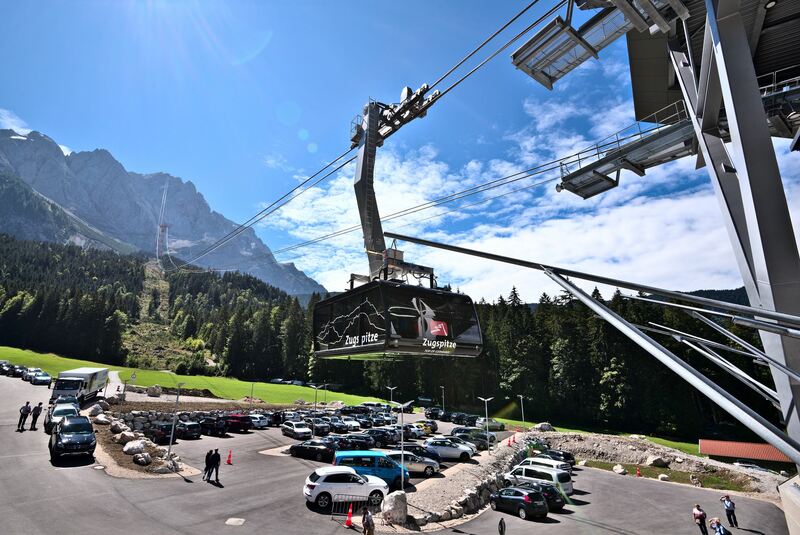 The new ropeway, which was opened just recently in December 2017, holds three world records: for the longest distance between the support tower and the mountain station (3213 metres), the greatest difference in elevation between mountain and valley station (1945 metres) and for the highest support tower (127 metres). 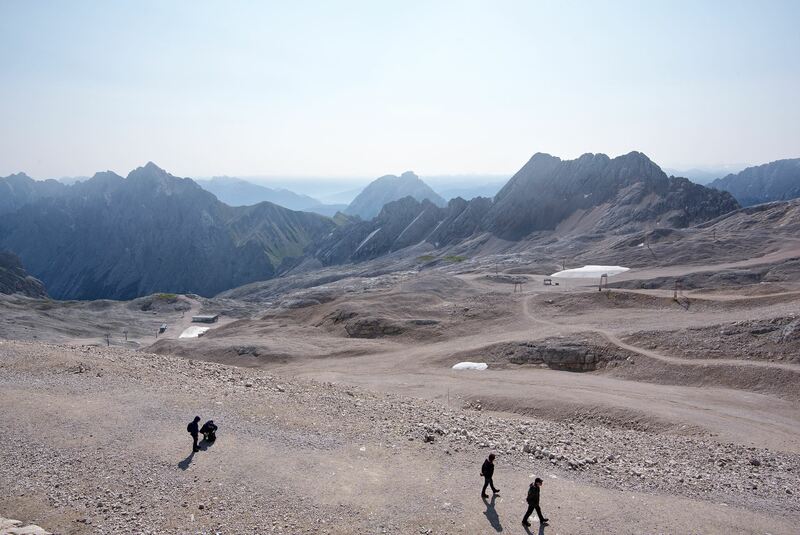 In September 2018, just a week after these photos were taken, the ropeway was severely damaged during an emergency exercise. At the current time (end of November 2018) operations have still not been resumed. 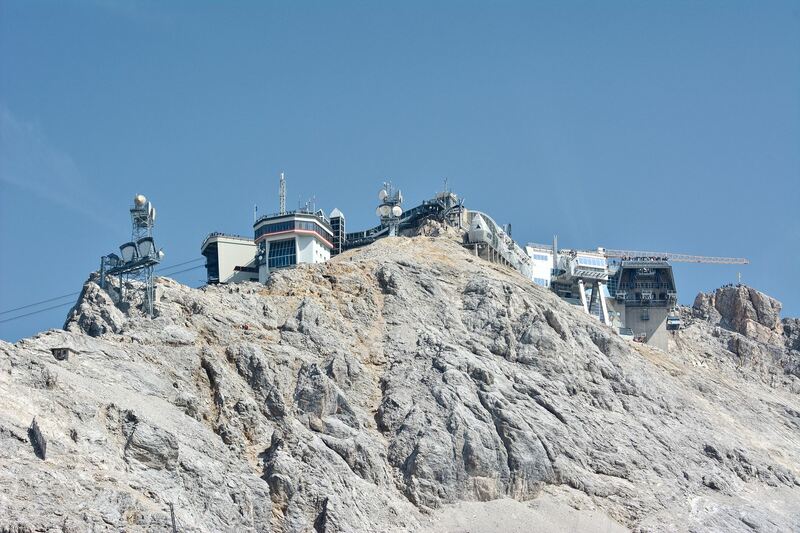 The summit can currently only be reached via the rack railway from the German side, or using the other ropeway from the Austrian side. 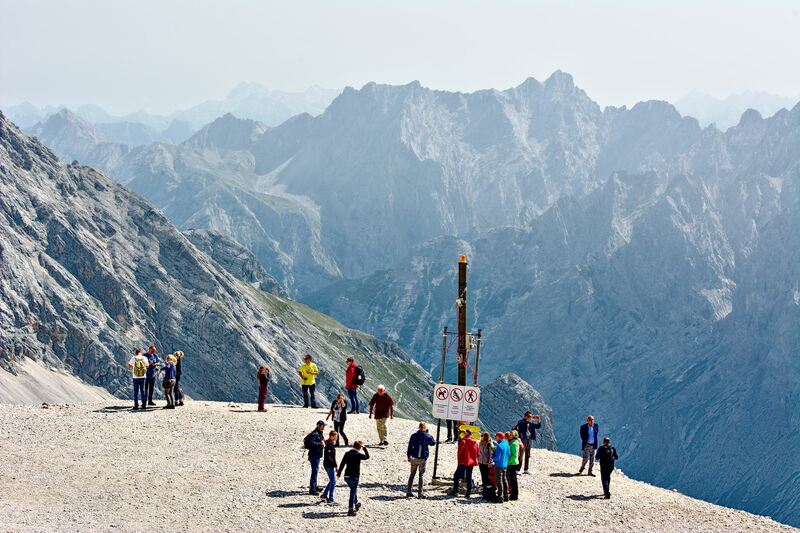 When the Zugspitze was to be developed for tourism in the 1920s, the engineers didn’t yet have any experience with ropeways of today’s dimensions. 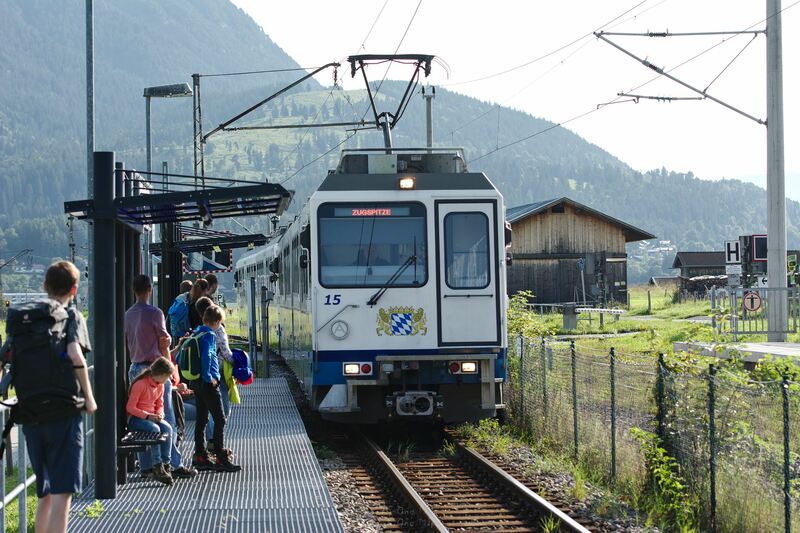 Instead they decided on a rack railway which works its way to the top through tunnels in the mountains. 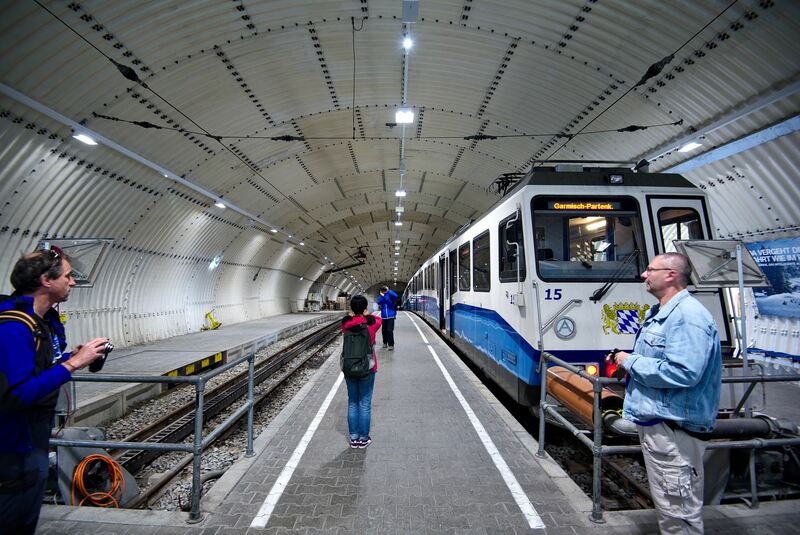 They also didn’t dare to build a train station directly at the summit, so the rack railway ends approximately 350 metres further down inside the glacier. 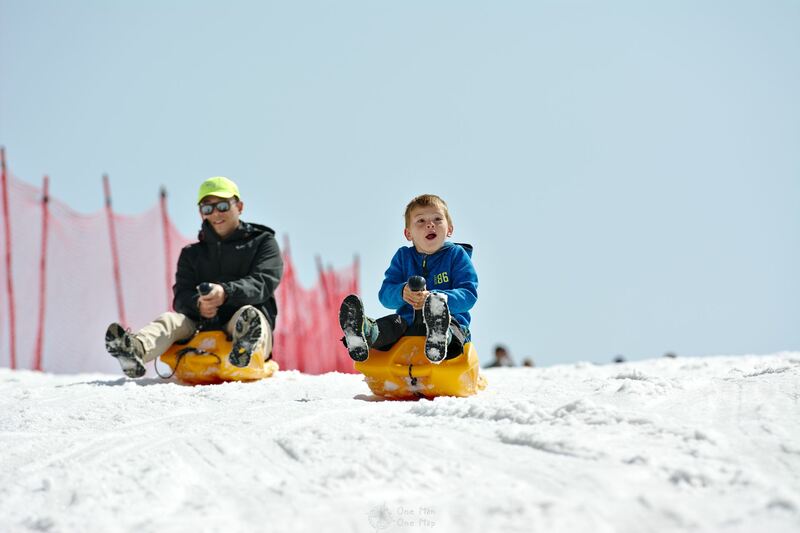 The last part can be covered using the glacier ropeway or on foot. 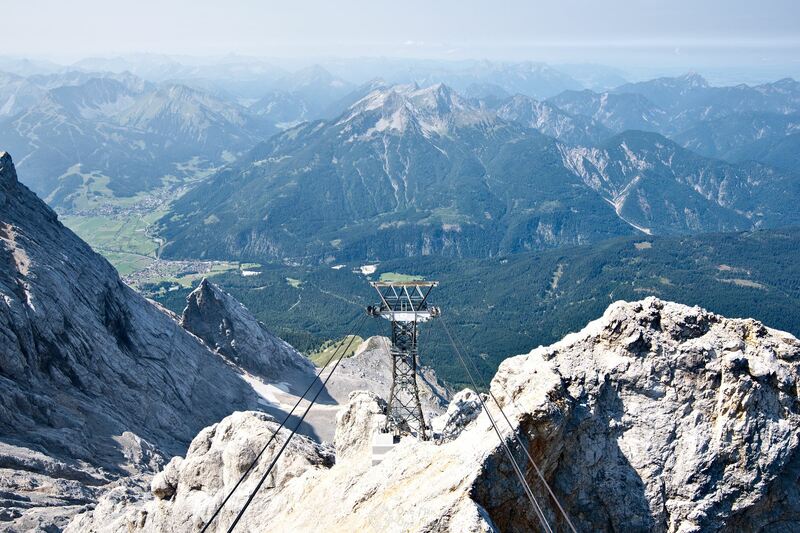 The round trip with the Zugspitze train and ropeways can be made in either direction. 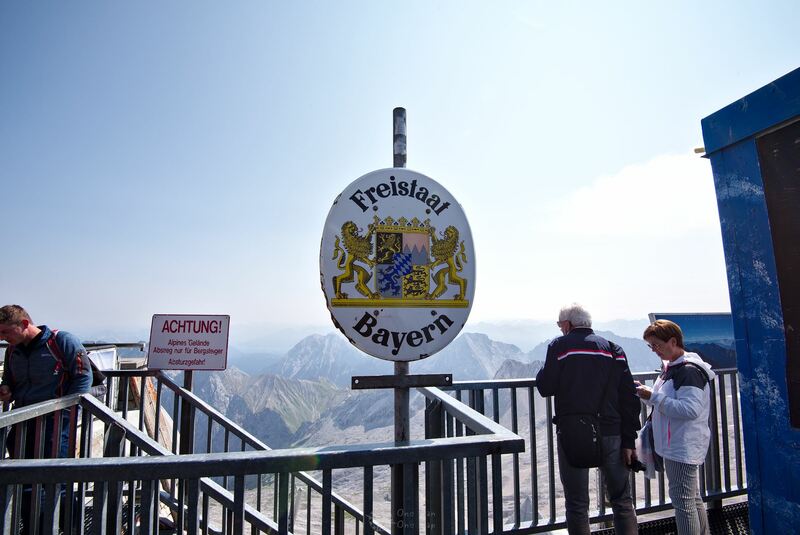 You can take the rack railway and the glacier railway up and then ride the ropeway back down, or simply the other way around. We decided to take the rack railway up the mountain. 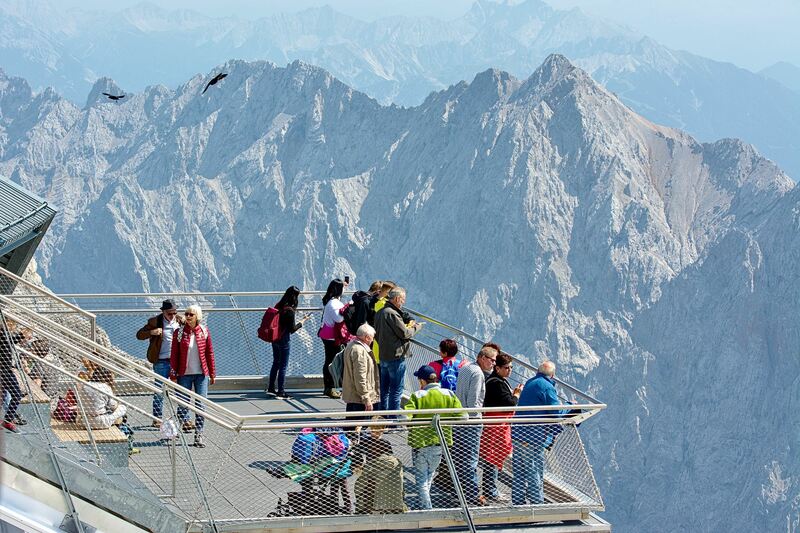 Unfortunately, in the age of gigantic panorama ropeways, it can no longer keep up with the other tourist attractions. 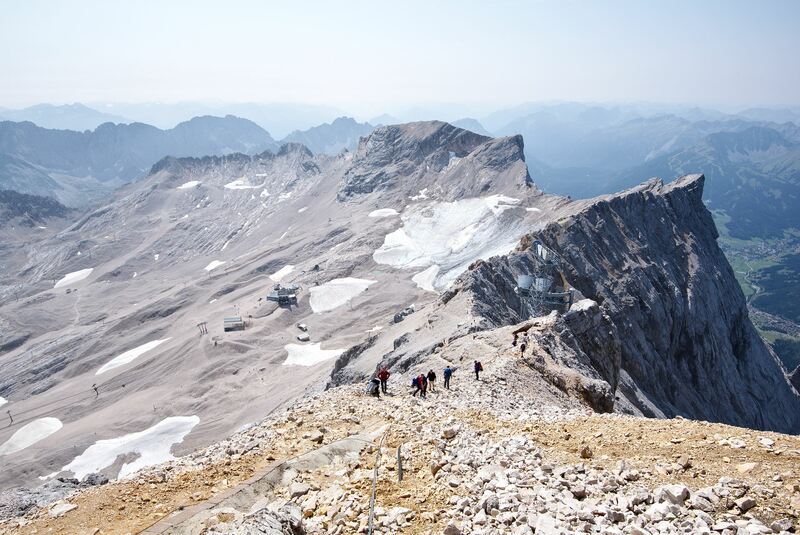 The journey takes a full 43 minutes, but on the short stretch to the entrance tunnel trees block the view and then you sit in the dark until you reach the glacier station. 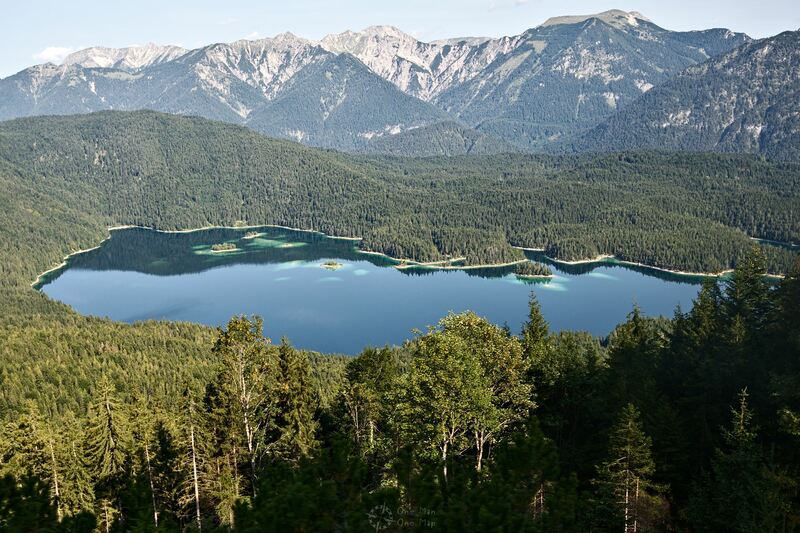 A short glance at the Eibsee lake had to suffice. 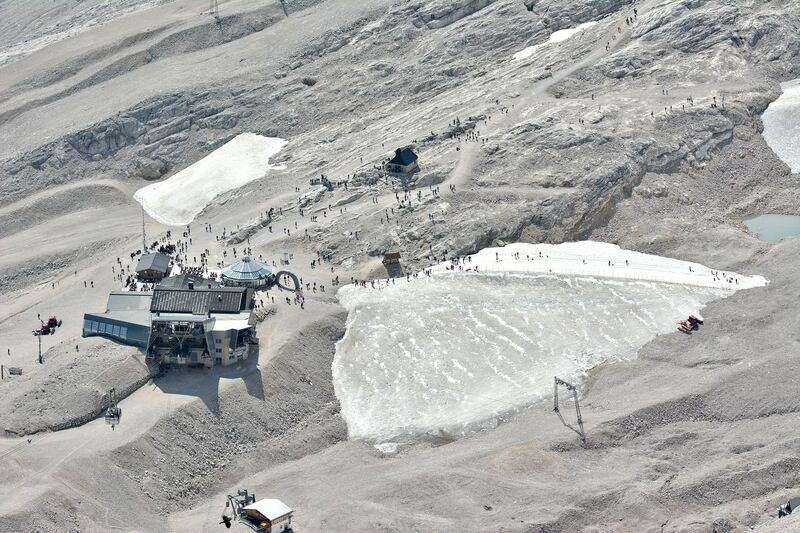 In the context of climate change, “glacier station” must be seen in relative terms. Where there was snow and ice all year round just 100 years ago, today during the warmer seasons almost only stones and boulders remain. 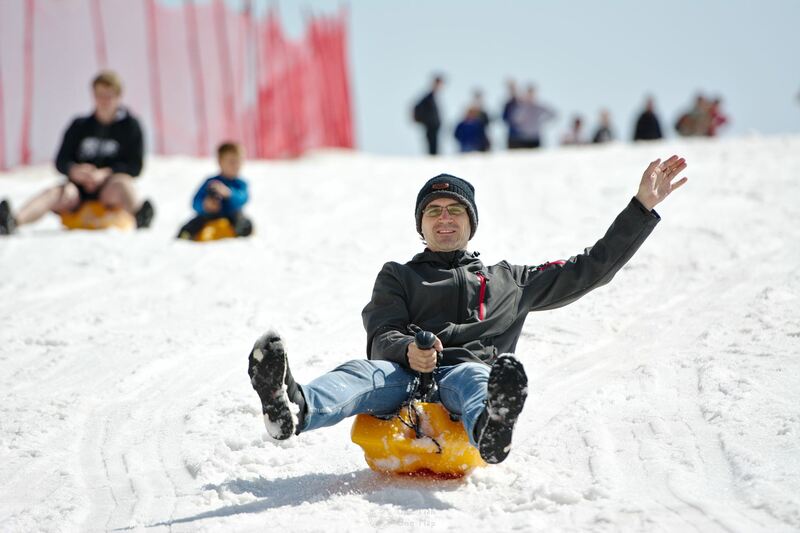 The ski slopes are open from November to May. During the rest of the year the cold wind can only hold back a few small patches of ice. 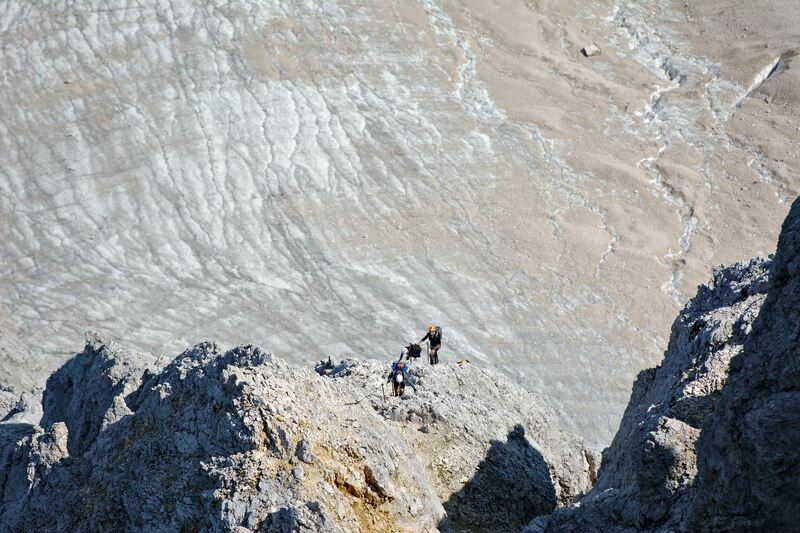 Here you can see the Schneeferner, the largest still existing glacier in Germany. 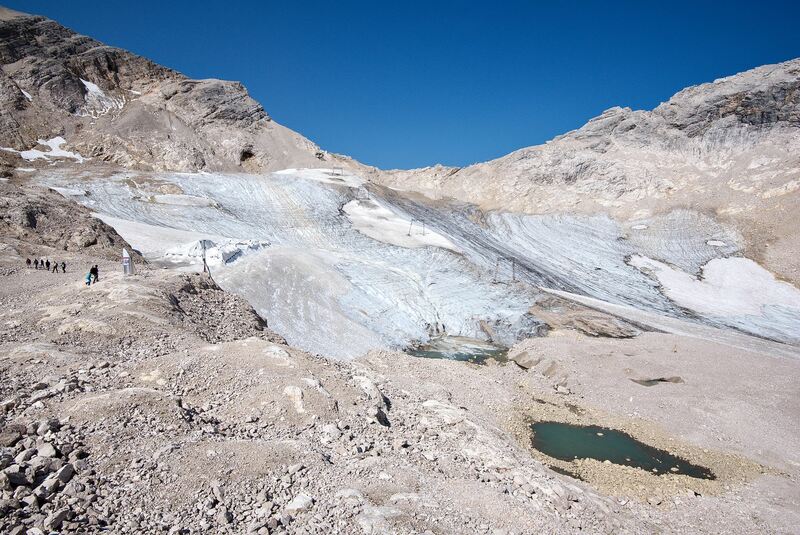 Some experts do not classify it as a glacier anymore, however, as it has shrunk to less than a third of its original size. 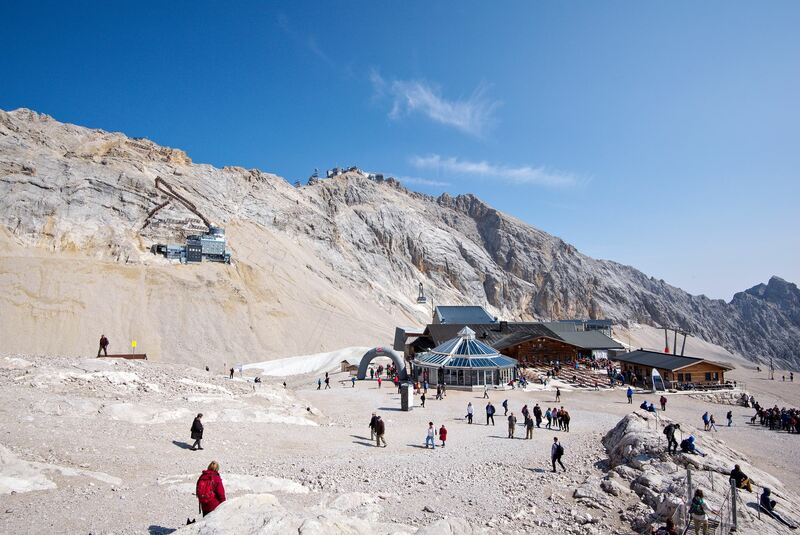 Between 1993 and 2013, the Schneeferner was covered with white plastic sheets to protect it from the sun’s rays. Sadly it didn’t have much effect. 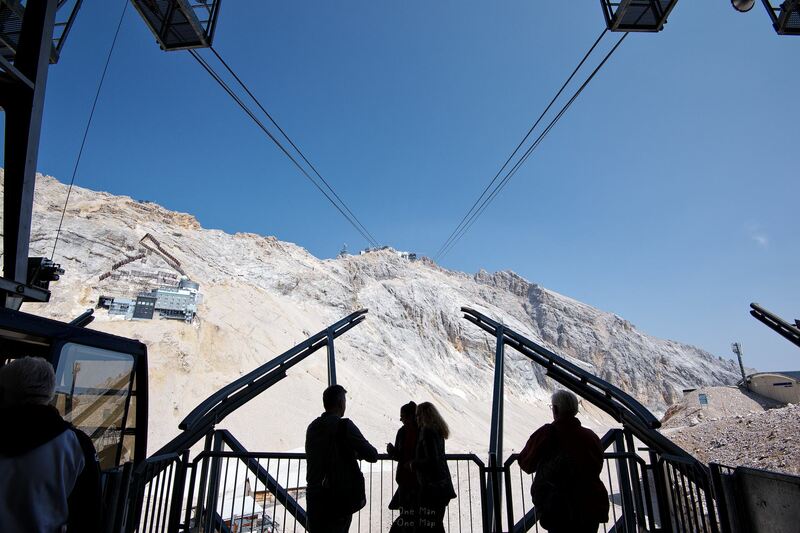 The glacier station is also a restaurant, hotel and the valley station of the glacier ropeway at the same time. Stuck to the slope you can see the prominent building of the Environmental Research Station Schneefernerhaus, in which the German Weather Service, among others, has rented some offices. 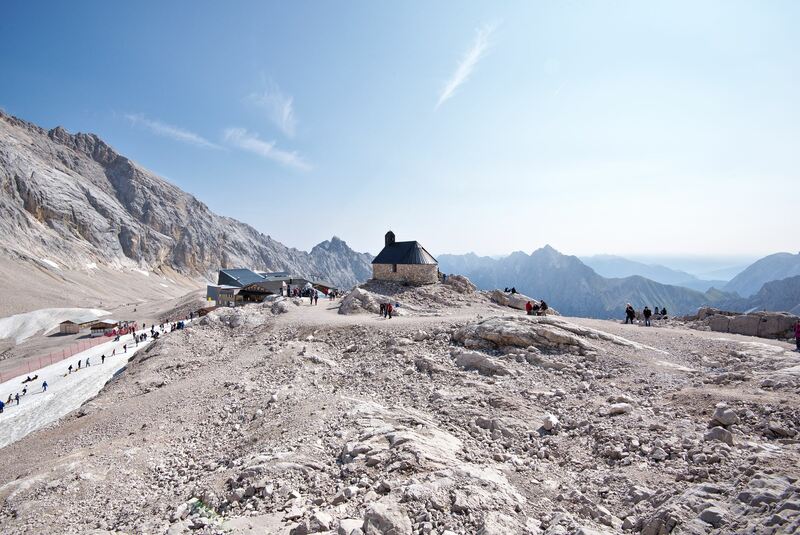 At a short distance from the restaurant is Germany’s highest church – the Chapel of the Visitation of the Virgin Mary. 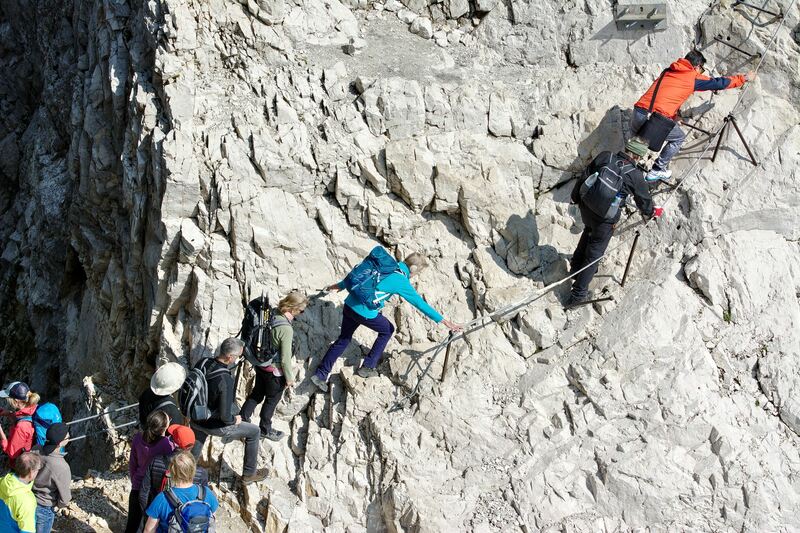 Wet and exhausted we went to the glacier ropeway and then on to the top, to the Zugspitze. Yes, a few years ago you had to bring your passport! 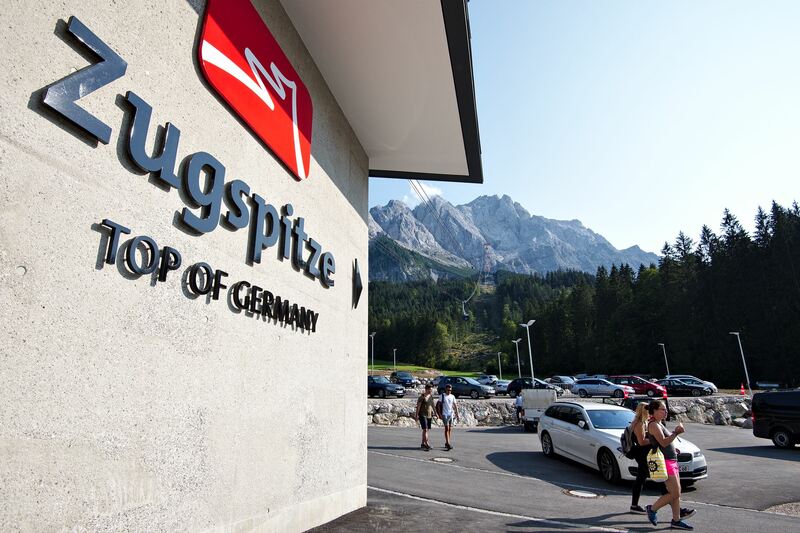 But fun aside 🙂 The official border between Austria and Germany runs through the middle of the Zugspitze, but there are no longer any border controls here. 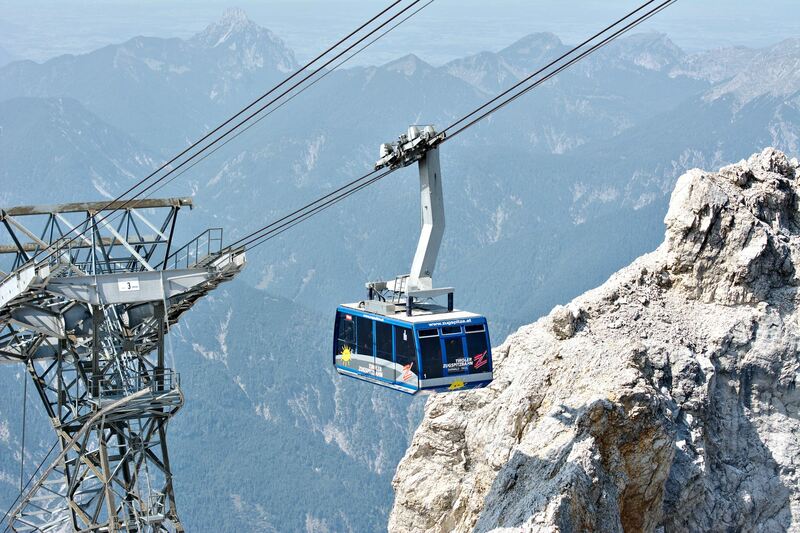 Theoretically you could take the German train or ropeway to the Zugspitze and then ride the Austrian ropeway on your waay down (or vice versa). 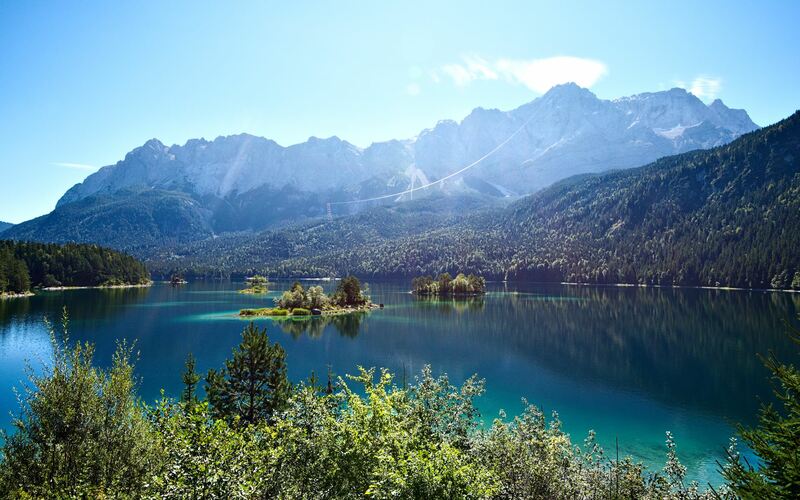 But that wouldn’t be exactly cheap: The round trip goes for 58 Euros on the German side and 46,50 Euros on the Austrian side. 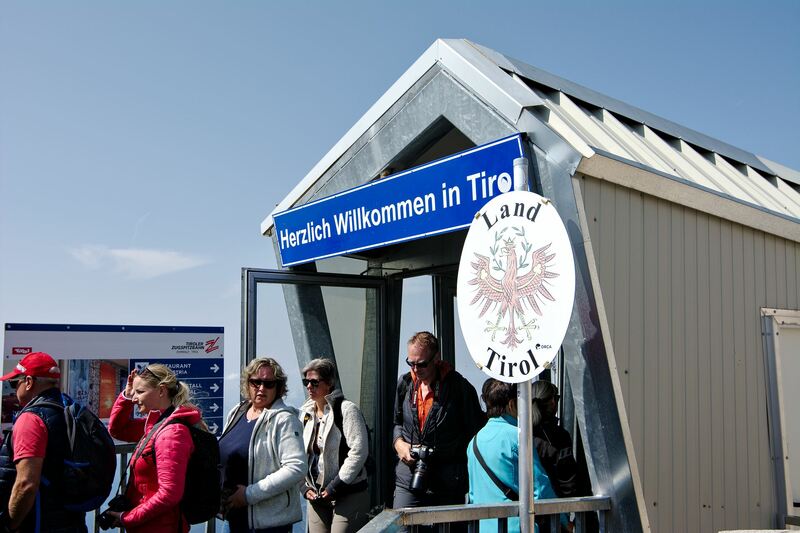 The single trip tickets on both sides would add up to a total of 65 Euros. 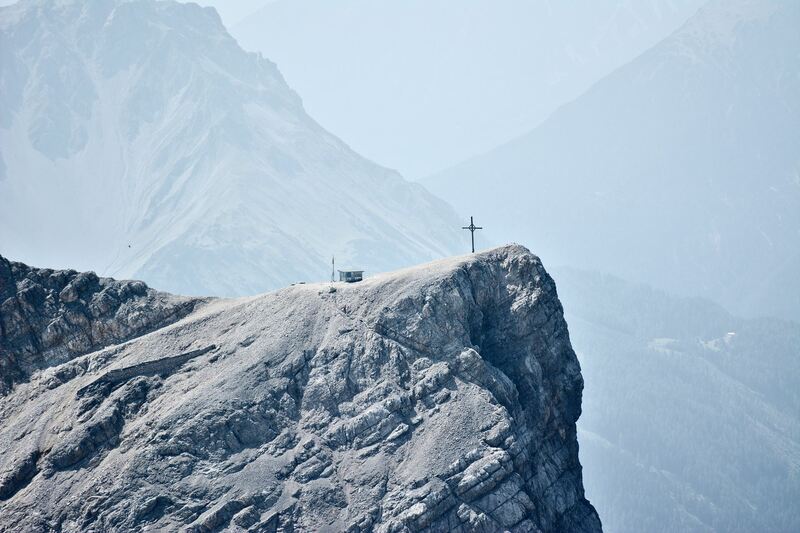 The closer one looks, the more scurrying tourists, hikers and mountaineers one can recognize at some point. 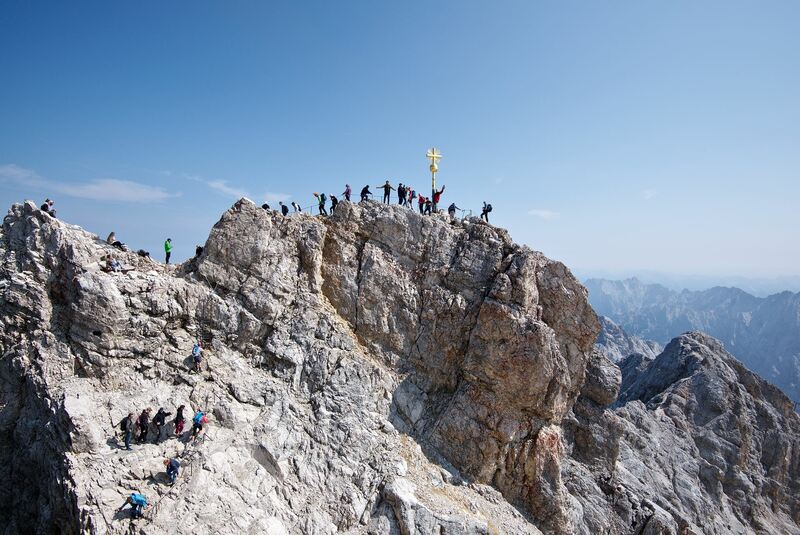 Of course, dragging a powerful zoom lens upwards also helps… 😉 The quickest mountaineering route to the Zugspitze takes about nine hours, but most alpinists choose the longer, less dangerous routes which are often split across two days.